As Americans all over the country celebrate Mexican culture and heritage, teach your students more about the country! The questions in this Cinco de Mayo worksheet are rather simple, and if students don’t know the answers to them, now’s the perfect time to change that. 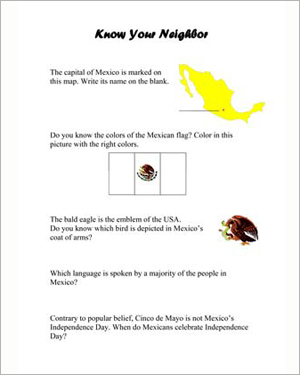 This printable worksheet quizzes students about the capital of Mexico, its Independence Day and other basic facts. And contrary to popular belief, Cinco de Mayo is not Mexico’s Independence Day!